It's a year today that guide dog Tess went missing - today we repost an article from around that time last year. 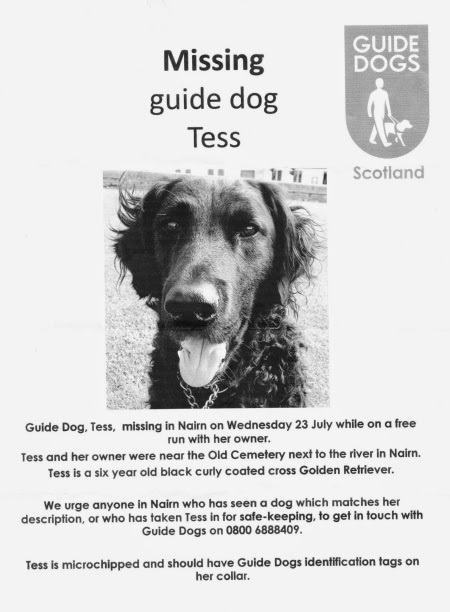 Female Guide Dog Tess- went missing near the Old Cemetery along the river in Nairn around 3 p.m. on Wednesday the 23rd of July last week during play time off the harness. She had apparently gone into the river chasing ducks and has not been seen since, despite searches of the riverside and nearby areas and posters being put up in the town. She has a leather collar with tags but no harness or attachments on her. Were you in the riverside area around that time, this includes the Broadhill side of the river, the Jubilee Bridge and playing fields, Mill Road etc and below the A96 bridge around about 3 pm.? Did you see anything? Were you in the town centre or anywhere else in Nairn and did you see a dog matching Tess’s description – see poster below. Did you see anyone with a similar dog? Did you see anything unusual at all? Please think about this and ask your family, friends, neighbours and workmates if they have any information or sightings. Please check your gardens, sheds, garages and any areas nearby where a dog might be. If you have a business with a yard etc please check that. Tess is more than a companion dog she is a working Guide dog and an important and vital part of her owner’s life. If you have any information at all it is time to come forward. There is a contact number on the poster but if you have difficulty with that number please contact the police on 101 and give them your information. So so sad for her owner. Let's hope she is found very soon. Thanks for posting this again. If Sutton Coldfield can do it...why not Nairn?